Looking for something you can do with your kids while trying to pass the time at the airport? 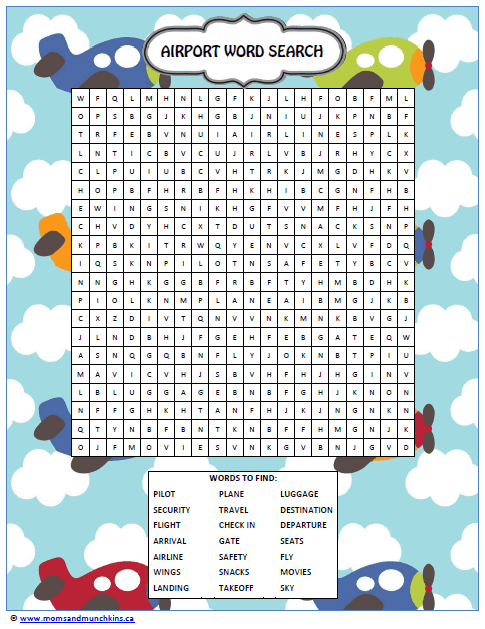 Try these 2 free printable games to play at the airport – Airport Bingo and Airport Word Search. Airport Bingo is really easy to play. Simply print the free printable game and cross off the square of each item as you find it. If you are playing against other players, the winner is the first person to find & mark off an entire row. A row could be a diagonal row, horizontal row and a vertical row. 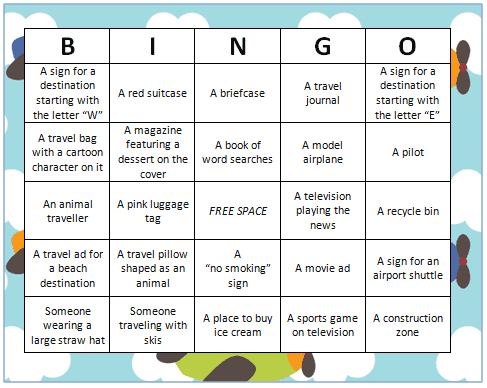 Be careful not to blink because you won’t want to miss spotting one of the items on the Airport Bingo game! This fun word search game is filled with words associated with the airport. All you’ll need for this game is the free printout and a pen. You then simply circle the words as you find them. You could also add a second piece to this game to highlight the words if you see it in print (on a sign, monitor, etc.) at the airport. Some of the searchable words are: Arrival, Gate, Seats, Airline, Snacks, Sky, Security, Travel, Luggage, Pilot, Departure, Movies and more! What other words would you use to describe an airport? For more games to play at the airport, check out this fun Airport Window Scavenger Hunt Game. There is so much to see while looking out the window at an airport! Can you find all of these scavenger hunt items? If so, you certainly deserve a special treat from the airport candy store! What do you always hope you’ll find in an airport? A delicious restaurant? A souvenir store? Some popcorn and candy? Where will you be traveling next? Wherever it is, I hope you and your family have a fabulous vacation! We’re always adding new ideas for family fun (including more freebies!) so be sure to follow on Facebook, Twitter, Pinterest and Bloglovin’ for the latest ideas. Thanks so much for sharing these. I have pinned this post for the next time we travel. Thank you for stopping by, Keitha! These are sure to beat the boredom of the airport for the kids! Thank you for the invite, Jill! These are great! Thanks for linking up to afterschool – pinning these to my traveling with kids board! Thank you so much, Maryanne! Great ideas but don’t wait to be going somewhere to go to the airport with kids. Make a date of it. For younger kids just watch planes take off or make a picture card of the Bingo game. For older children let the ‘plan ‘ a family trip that includes a plane ride. Let them experience an airport before they have to use one. Don’t forget bus stations, taxi cabs, etc. Just go for the experience. Great idea, Diane! Mini adventures can be just as fun as big adventures! Balloons have saved our lives numerous times in airports. Blow them up once you get to through security screening and they’re off. We often end up creating an impromptu play area for our kids and others that join in to the relief of fried parents! These are FABULOUS – thank you so much!!! You are so welcome, Melissa! Thank you for stopping by.